The dining table is the centre of family life, it’s where you sit with friends, write Christmas cards, do your accounts and celebrate special occasions. 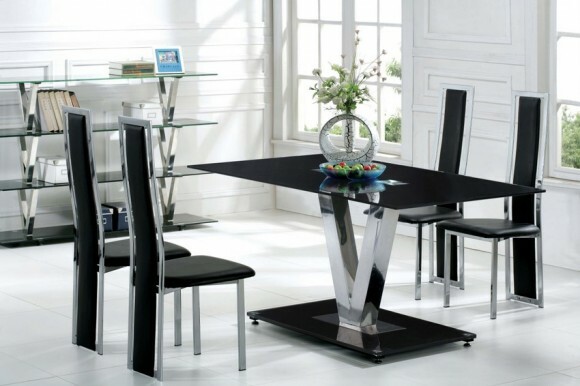 A good dining table must suit the space it will occupy and be appropriate for the needs of those who will use it most. Dining tables come in all shapes, sizes and materials: round, oval, rectangular, square, wood, glass, tiled, even carpeted! The choices are myriad and they are not exempt from the changing fashions of interiors. I’ve been in a 1970s house where the dining table was upholstered in the same carpet as the floors and whilst this was probably a very fashion forward decision at the time, it is not something I would recommend. I tell you this as a warning to be wary of fads. First of all think of the shape that would best occupy the space where your table will live. If space is tight, a square or rectangular table gives the best proportion of table top to footprint, but a roomy kitchen or dining room could be well served by a round or oval table. Many dining tables are extendable, which can be very useful for large dinner parties or craft projects. Glass tables are elegant and stylish, but they can be hard to keep clean if there are small, sticky fingers in the household. Wood has been used for tables for hundreds of years, but there are many different types of wood and as many different finishes. A durable varnish is usually the best option for a well-used table, but it is still an idea to use mats for hot pots of food. The most enduring designs are usually simple. Opt for quality materials and a simple design, and chances are your table will never look as dated as the 1970s carpeted one!